You can see how, at a distance, I could mistake this large thistle head for a mouse all hunched up and having a bad hair day. 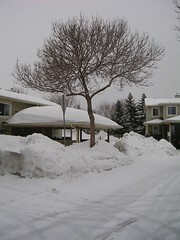 This is that tree that was and still is buried by the snow plows. 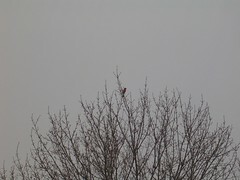 I thought I saw branches from which the bark had been chewed by rabbits but I can't see them now or in this photo. However, I did see rabbit foot prints hopping up this snow bank and onto the roof of this carport, so I may have been right that rabbits have been chewing the bark in the high branches of trees that they would never normally have access to. 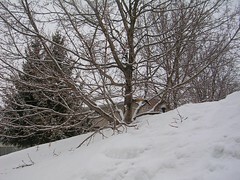 Time will tell - in the Spring when the leaves start out, the girdled branches will likely be dead. At least, I know that when young trees are girdled (bark chewed off all the way around the trunk), they die. 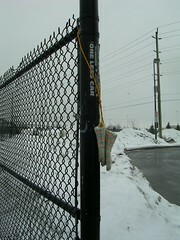 In a 20 foot stretch of sidewalk at the transit station, I came across two found items hung up for the owner to see. 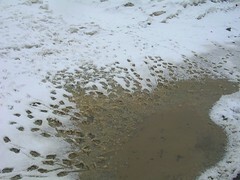 I saw hundreds of webbed foot prints beside the bike path. At first I thought they were duck prints but then I realized I had not seen any ducks but I have seen seagulls. And I guess they are not "sea" gulls but just some other sort of gull. At any rate, it looks like they were having a meeting at this mud puddle! We're finally getting a whiff of Spring here. I took this photo of the construction site early in the morning when the light was low and golden. It was still minus 12C that morning but the sun was strong. 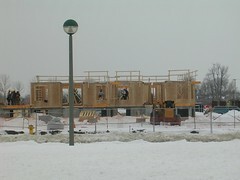 This is a slightly different view of the site, showing the progress that is being made. I'm still surprised that they are using 2x4 construction in the walls, but then, I don't know what they are using for floors. 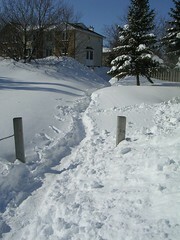 All winter, they've been plowing some of the paths off to one side. Now we have to walk through mud. 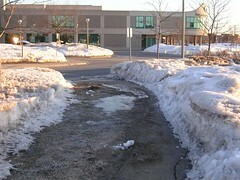 This also shows me that when people pave where people have worn a path, they often make a more "artistic" path and don't go where people (and plows) naturally tend go. Of course, they may have just wanted to make the path cross the street at right angles to make it safer. 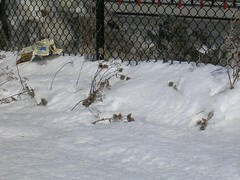 This photo shows how much the snow has melted under its own steam, so-to-speak. Plows and shovels don't go into this centre island and so any snow that fell on it, stays on it. At one point, you couldn't see the top of the stylized "N" that holds the Nepean bell but now you can see quite a lot of it. 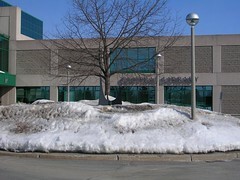 This is the snow bank near the Centrepointe Theatre, which faces roughly west. It hadn't started to melt yesterday morning when I took this picture but it is dripping today! I walk across Centrepointe every day, at least twice a day. I use the designated crosswalk near the Marshy's plaza and I usually push the button that makes the traffic lights go red for the cars (if there are no cars in sight, I just walk across without pushing the button). These traffic lights are the regular kind, with the red/yellow(amber)/green lights, not the big yellow crosswalk "X". So when cars are approaching the crosswalk, after I have pushed the button, they see the lights turn from green to amber and then to red. I haven't timed how long the lights stay red but it is for about one minute - long enough for a slow walker to get safely across. There are four lanes on the road along Centrepointe. 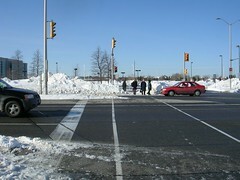 Usually traffic travels in the centre two lanes and the outside lanes are used for turning onto roads that branch off of Centrepointe. However, at this crosswalk, a lot of the traffic travelling south makes a left hand turn into the plaza and so cars going straight trough go around them and into the right hand or curb lane. All of this is legal. What really burns me are the cars that proceed through the crosswalk AFTER the light has turned red. They do this because they can get way with it because no one has actually started to walk across the road and so they don't risk hitting the pedestrian who pushed the button. I experimented recently, watching the cars approach on the amber and I stepped into the road AFTER the light had gone red but while a car was still motoring through the crosswalk. The car was in the far lane from where I was and so we both knew I was not going to get hit but I got close enough to the car as it passed me (going through the red light) that I could have touched it if I'd run instead of walked. This makes me crazy because the wait at the crosswalk is all of one minute (maybe less - I'll try to remember to time it one day). The driver of a car, who, by the way is sitting down in a nice warm box, has to wait an entire 60 seconds while some freezing pedestrian struggles across the road. Apparently that is too much to ask of drivers. s. 114 (15) Every driver approaching a traffic control signal showing a circular amber indication and facing the indication shall stop his or her vehicle if he or she can do so safely, otherwise he or she may proceed with caution. R.S.O. 1990, c. H.8, s. 144 (15). s. 114 (31.2) Every person who contravenes subsection (15) or (18) is guilty of an offence and on conviction is liable to a fine of not less than $150 and not more than $500. 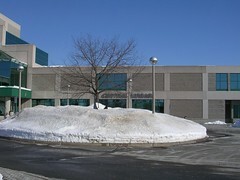 1998, c. 5, s. 26. Not much green on St. Patrick's Day, except for what people were wearing. Nice sunshine though, even if it was unseasonably cold at minus 14C this morning. Ouch. On the weekend, you could really see that things were melting nicely but you only see bare pavement if it had been scraped earlier. 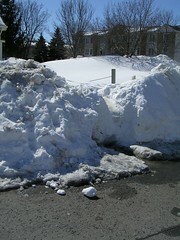 The city is still working at removing snow banks and probably will be until summer. We passed this dog and his owner out for a walk. He is not even a year old - a great big puppy. I think his name was Meiko. He was lovely. The construction is proceeding. More foundations are going in and the Stone Slinger was there, slinging stones. 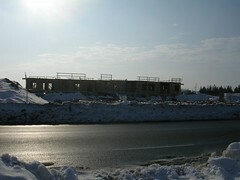 This one building now has some structure above the foundations. I see they are using what looks like proper safety barriers at the edge of the top level. I learned about them during the "Fall Prevention Course" that I took at Safety Training Inc.. Speaking of falling, someone has dug out the storm drain at the base of the snow mountain where everyone walks every day, to get into and out of the 'hood. There was a huge puddle there and so it's good that it is draining now. But that first step is a whopper! It is actually about 4 feet off the ground, if you are standing on the storm drain, trying to get over into our neighbourhood. Thankfully, some intrepid souls have stomped out some new foot prints in the snow bank to the side and so I can take a short detour and still use this path. Not for long however, as once it starts to melt in earnest, everything will crumble. I just don't want to be standing four feet off the ground when it decides to give way. The Equinox is almost here! 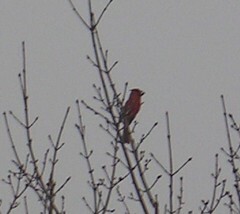 And this morning I heard the Cardinal singing again. He's all pixilated but he still looks lovely to me. 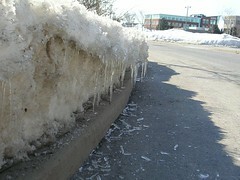 On the way to work this morning, I saw that the snow banks had started to crumble in onto the sidewalks. I suppose I cannot complain because there are places that don't have clean sidewalks at all. 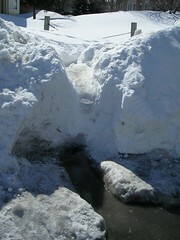 I also noticed yesterday that the fire hydrant that would service the houses in my area has not been uncovered. I knew approximately where it was but couldn't remember exactly. Here is what the island with the two trees on it looks like. The hydrant is somewhere in the middle, or so I thought. 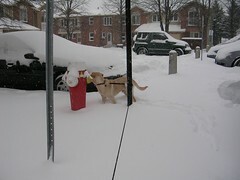 So I looked through some old photos and here is the puppy we raised for Guide Dogs, not interested in the hydrant but showing where it is. If you compare the two pix, you will see where one would have to dig to find it. 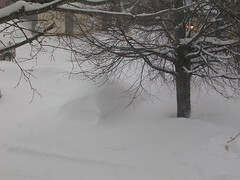 I think there must be at least 3 feet of snow on top of it but because it is at the back of the island and near the car that isn't coming out until Spring, it will be difficult to dig out. 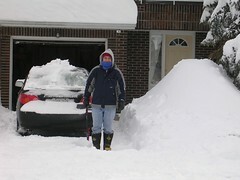 I was going to go at it with a shovel but it really has to be attacked from the road side (because the car is on the way) and that means using a small snow blower to get near it. 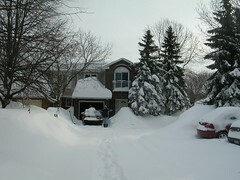 We're still digging out. 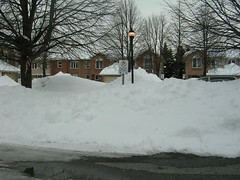 Apparently, we had 52 cm (20 inches) of snow and with the 10 feet or so we had before this dump, there's no where to put it. And it's not melting much yet. Crews are clearing for vehicles first but there are a few spots cleared for pedestrians. 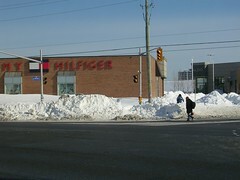 At the big intersection at Woodroffe and Navaho, where many people coming from the bus station cross to get to Algonquin College and to the College Square shopping plaza, they have done a good job clearing the way. They haven't cleared in all directions so you may have to walk out and then over but at least you can manouever. 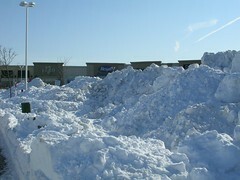 At the shopping centre, there are still huge piles of snow, waiting to be taken away. Where, I am not sure. 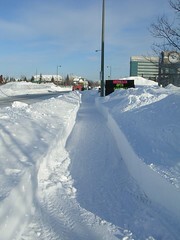 They haven't bothered to plow the bike path behind the bus station - it's not a priority. 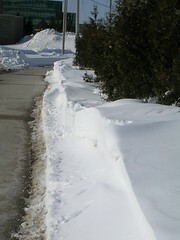 The wind was strong during the snow storm and after and the snow has drifted into pretty shapes. Along this section of the path, I saw some nice wind-sculpted shapes yesterday. Today, they are being broken up a little by people walking along and touching them. 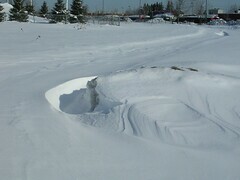 You don't even have to bend over to touch these drifts! What you can also see is how the sun is melting whatever is left on the pavement. If you could navigate some of the snow banks, you could be riding your bike in some places. Compare this photo to the one I took on December 17, 2007. 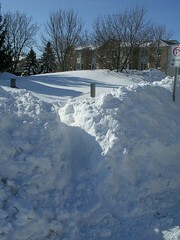 The Nepean bell is almost completely buried now. 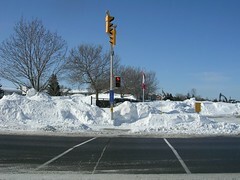 This is where I usually cross Centrepointe. 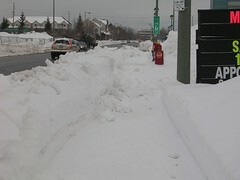 In the past, I have complained about how they don't plow a path through the snow banks at the crosswalk. This time, there's a nice clear path but nowhere to go! 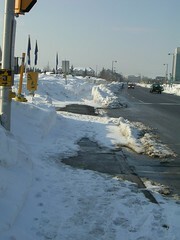 Once you cross and head south on Centrepointe, the cleared sidewalk ends abruptly and you have to walk in the road. I guess I can't have everything. 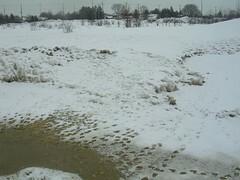 Finally, I wonder if the path between Plunkett and Castlebrook will be cleared any more this Winter. After the second last snow fall, they didn't clear it and now it looks like a lost cause. 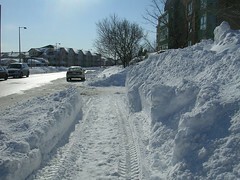 Apparently, it's not in our snow clearing contract so they have been doing it just because it's there. However, now, we are walking about 2 feet off the ground. The main problems are negotiating the mountains at either end of the path, and going off the narrow packed path and up to your hip in snow. And hope you don't meet anyone walking the other way on the path. It's just like the good old days! 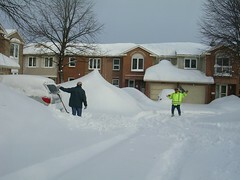 People are still digging out. There are enormous snow banks to traverse - I feel I should have ropes, an ice axe and pitons. 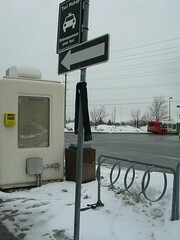 I wore my a-line skirt today and the knee high boots and was glad I had for climbing the snow banks. A narrow or pencil skirt would have made it impossible and anyway, I wouldn't have wanted to hike it up because of the cold this morning. Yikes! Talk about insult to injury. It was minus 17C this morning not including the windchill. 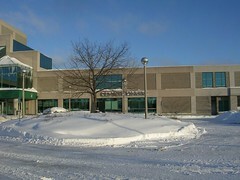 With the sun out, it has now warmed up to - 7 but really, I think it is supposed to be warmer. 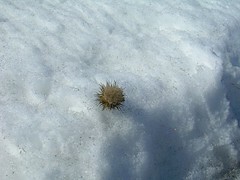 But even so, the sun is melting snow and ice. Every few minutes, something slides off my roof and smashes to the ground. 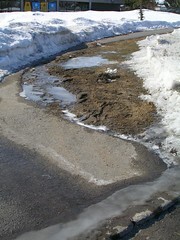 It'll be a while before the grass sees the light of day again but there are stretches of bare pavement here and there. 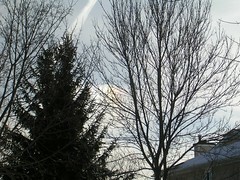 This morning I saw a large sun dog and tried to get a photo of it and failed. You'll have to take my word for it - it was quite pretty through those bare branches. Even though I was pretty sure not many people would be at my class, I decided to act as if I was going anyway. I got up and had breakfast and organized myself and then spent about 20 minutes shovelling a path to the street, which itself was not yet plowed. Nice neat path! The wind was from the East all night and our side of the quad drifted in more than the other side. 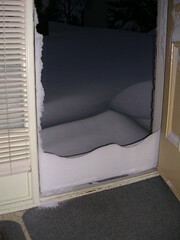 That snow was about 2 feet deep and packed in. 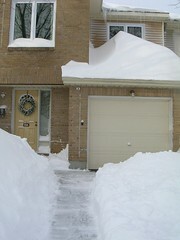 Before I took these pix, I had seen and talked with another neighbour who was out taking pictures. 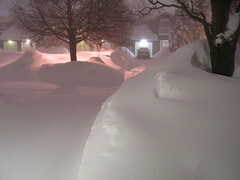 Right after I finished shovelling, I got the phone call that my class had been cancelled so I decided to take a few extremely local pix of my own. 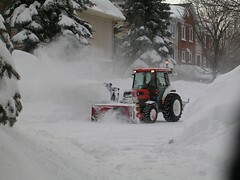 I didn't even get out of the quad, although I could now that they've started plowing. 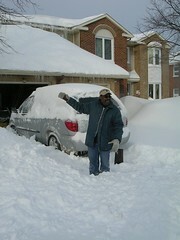 I saw Robert across the way shovelling out. I got a little closer and noticed that he didn't have Logan out with him as usual. Can you spot the dog? They have all the machinery out today. John is saying, "Where are we going to put it all?!" When John first shouted "hello!" 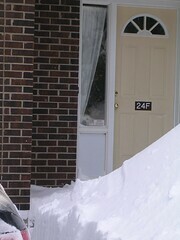 from near the garage door, I could barely see his head above the snowbanks. But. We still have not broken the record from 1970-71. And there wasn't a paper, either. I took these yesterday afternoon from my sewing room window. In this photo, that lump to the left of the tree was a car. Peter took this one last night. The car has completely vanished. More pix when I get out to get 'em. I just remembered to look at the weather on the web. Ontario provincial police in the upper Ottawa Valley and Northumberland have resorted to snowmobiles for transportation. 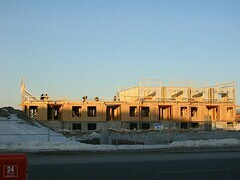 Yesterday in between snow storms (insert humourless laugh here), I noticed that there was now what appears to be framing above the foundations on the Minto building across from Marshy's. 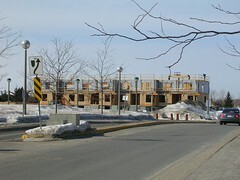 I wonder if it is framing because the buildings are three or more storeys high but time will tell. I don't have the blueprints. 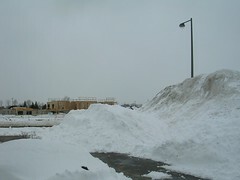 I also noticed that the snow is kind of piled high at the side of the plaza. 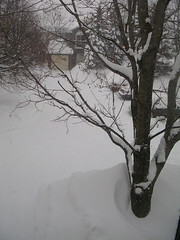 Last night we got another foot (not an accurate measurement - I just looked out the door) and we're getting more now. Peter took a few pix this morning. Zoom has decided she doesn't hate Winter any more. I know that no matter what, Spring will come along and soon. 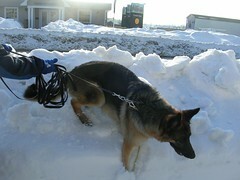 But the bother of boots and the weight of coats and the struggling through snow is beginning to pall.